Deep in the bunkers of Nazi Germany, many of the world's top scientists worked to create a new generation of war winning super-weapons. A few of these, such as jet aircraft and the V2 rocket, became realities at the end of the war, others never made it off the drawing-board. 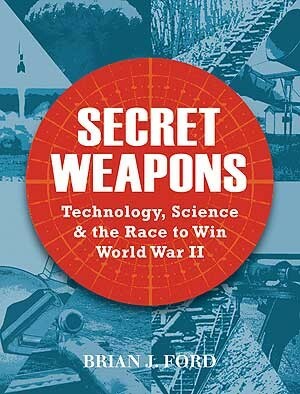 Written by noted research scientist, Brian Ford, this book charts the history of secret weapons development by all the major powers during the war, from British radar to Japanese ray-guns, and explains the impact that these developments eventually had on the outcome of World War II. Brian J Ford is a prolific research scientist who launched major science programmes for the BBC. His books pioneer new approaches in bringing science to the public. Over 100 editions of his books have been published around the world, and he appears in TV programmes produced in studios ranging from Hollywood to Delhi, and from Germany to Japan. He pioneered regular 'science reports' on television news, went on to introduce regular science to BBC radio with Start the Week and Newsbeat. He has broadcast on The Food Programme, Woman's Hour, Newsnight, Any Questions? and Sky Television News. In 1998 he joined the annual Round Britain Quiz, partnering Lady Antonia Fraser, and he has featured in his Science Hour phone-in sessions for LBC. In addition to textbooks he has also written the popular 101 Questions about Science books. His First Encyclopaedia of Science (for the pre-teens) sold over 70,000 copies in a month. Brian J Ford contributes to The Guardian, The Daily Telegraph and The Times.